Posted March 23, 2016 by Materials and Surface Science Institute, UL in News. “Crystals come in all different shapes and sizes and can be found everywhere in nature. Most of the medicines we take are made up of compacted powders and the individual particles of the powders are in fact tiny crystals.” Prof Kieran Hodnett, SSPC Scientific Director. Rachel Scarry, Aoife Ryan and Billy Clarke, Coláiste Bhaile Chláir, celebrating outside the Analog Devices Building, University of Limerick. Photo by Alan Place, Fusionshooters. Following the great success of the 2014 SSPC National Crystal Growing Competition, which was launched as part of Science Week to celebrate the International Year of Crystallography 2014, the Synthesis and Solid State Pharmaceutical Centre (SSPC), announced the winners of the 2015 SSPC National Crystal Growing Competition at the University of Limerick on Friday, March 4th, 2016. 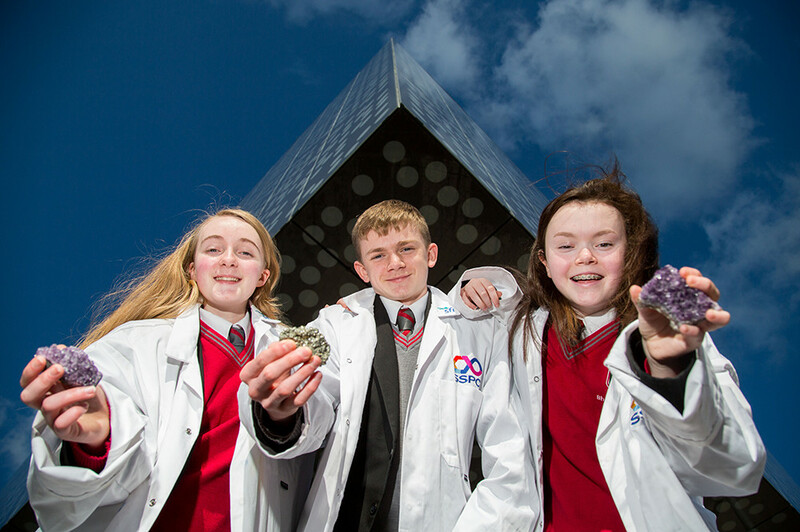 The competition was open to primary and post-primary schools in Ireland and aimed at students who were challenged to grow a single crystal from a variety of compounds such as: Salt (Sodium Chloride), Alum, Sugar, or Copper Sulphate. 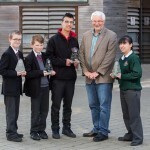 At the award ceremony, Professor Michael Zaworotko, SSPC collaborator and University of Limerick’s Bernal Chair of Crystal Engineering, announced the winners of the SSPC National Crystal Growing Competition. First place prizes were awarded to Aoife Ryan, Coláiste Bhaile Chláir, Galway and Keat’s 5th class from Scoil Íde primary school, Limerick. Second runner-up prizes were awarded to Dominika Dacus, Cabinteely Community School, Dublin and Billy Clarke, Coláiste Bhaile Chláir and third runner-up prizes were awarded to both Dean Byrne, Cabinteely Community School and Megha Theresa James, St Paul’s Secondary School, Dublin. This year an additional prize was awarded to Rachel Scarry of Coláiste Bhaile Chláir, for the most innovative crystal. 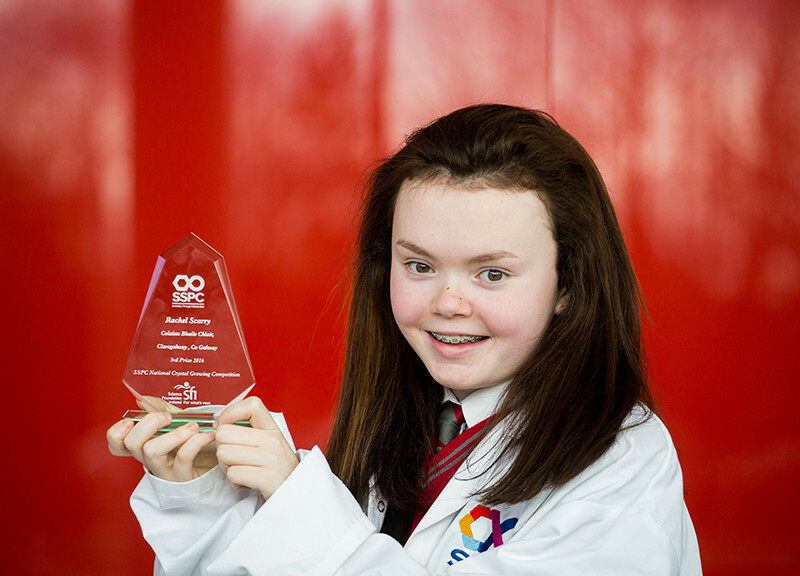 Rachel Scarry, Coláiste Bhaile Chláir, winner for the most innovative crystal. Photo by Alan Place, Fusionshooters. 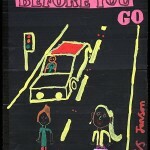 Left: First place prize winner Aoife Ryan, Coláiste Bhaile Chláir. 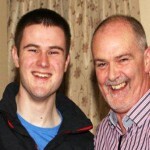 Right: Second runner-up prize winner Billy Clarke, Coláiste Bhaile Chláir. Photos by Alan Place, Fusionshooters. Growing crystals takes time and the best crystals are those which have grown slowly. The final judgement is based largely on fundamentals such as the crystal definition, clarity, size and overall quality. The judging panel complimented the excellent standard of entries at this year’s SSPC National Crystal Growing Competition. 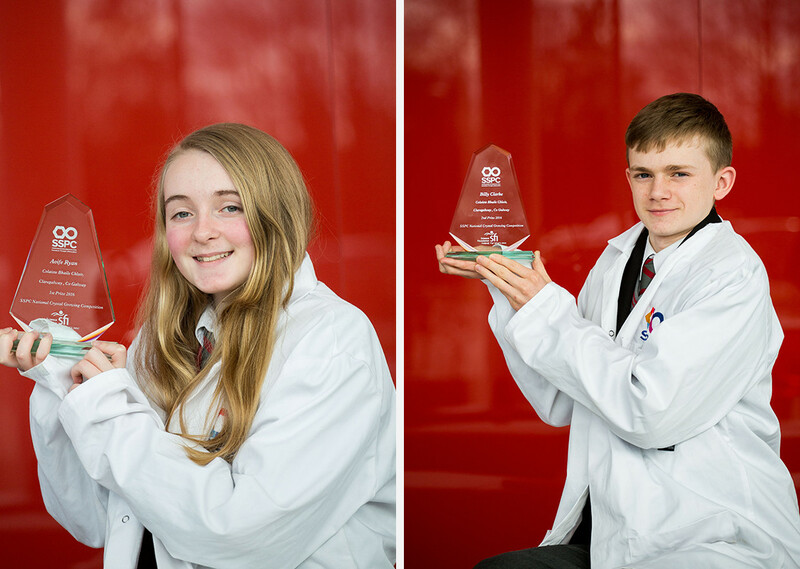 The crystals submitted to the SSPC National Crystal Growing Competition will be kept on public display at SSPC headquarters at the University of Limerick. 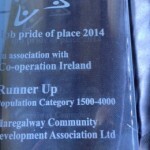 This event was supported by the University of Limerick. The Synthesis and Solid State Pharmaceutical Centre (SSPC), is a world-leading research centre focused upon next generation medicines by developing more environmentally sustainable methods for drug manufacture; increasing the range of medicines available to the public; and reducing drug manufacturing costs. The pharmaceutical industry employs over 25,000 individuals directly and 24,500 indirectly in Ireland, and produces over 50% of all exports, making Ireland the second-largest pharmaceutical exporter in the world. The primary objective of the SSPC is to retain existing jobs and to create new jobs within the pharmaceutical industry in Ireland. The SSPC is dedicated to developing the next generation of scientists through its education, outreach and training programme. To find out more information go to sspc.ie/crystal_growing or contact SSPC Education & Outreach Officer Dr Sarah Hayes sarah.hayes@ul.ie.